A big thanks to Mom who visited this week and brought Mayflower genealogy evidence for yours truly, the author of Growin’ Up in Maine. 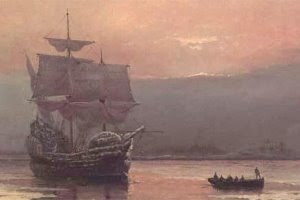 This history and genealogy details my ancestry on the maternal side back to William Brewster, a prominent passenger on the Mayflower arriving in America near Plymouth, Massachusetts in November 1620. Winter was spent aboard ship with the official landing the following spring. The family oral history of relatives aboard the Mayflower was finally documented in writing by my mother’s sister in June 2005, and then given to me 1,191 days later. That’s a tad slow, despite our very large family, considering the Mayflower voyage took just 66 days. I am a 14th generation descendant of William Brewster, best known as a religious separatist who fled England to Amsterdam in 1608 and later escaped to America with 102 passengers and the crew of the Mayflower leaving Plymouth England in September 1620. Here is my Mayflower genealogy leading up to Growin’ Up in Maine. *The genealogical records show the Massachusetts birthplace and marriage of Bathsheba Young-Higgins and husband Levi Higgins who were married on February 19, 1767. Their son, Elkanah Higgins, was born in Bar Harbor, Maine, on August 16, 1769, and thus became the first official Mainer from our line of Mayflower descendants. Rules are rules. His parents were “from away”. Looking at the timing of the marriage and birth you can’t help but wonder how many other Bar Harbor honeymooners fall in love with Maine, and never go home. Further online research of William Brewster descendants to document any 15th generation people besides Roger Degerstrom, my son, includes a surprise discovery of Sarah Palin, former Governor of Alaska. That old adage often heard by Americans stating “my ancestors came over on the Mayflower” is certainly true for the author of Maine stories at Growin’ Up in Maine.